Rupert Pupkin Speaks: Underrated '45 - John Knight ""
John Knight does not host a blog,but he is a regular contributor to The Hannibal-8.Laura's Miscellaneous Musings and Riding The High Country. 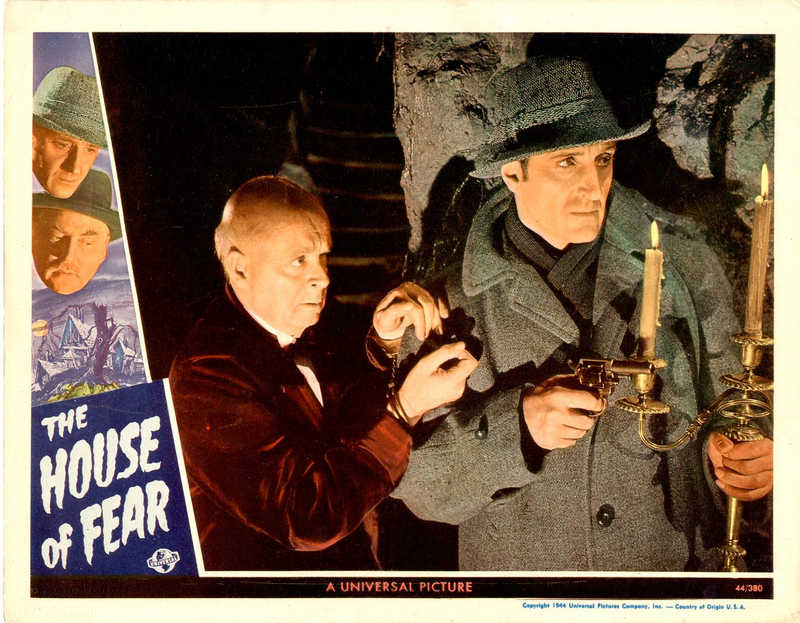 The last of Universal's Monster Jamborees,at least until A & C came along Wolf Man Lon Chaney hopes that Mad Doctor Onslow Stevens can finally cure him-he should be so Lucky! 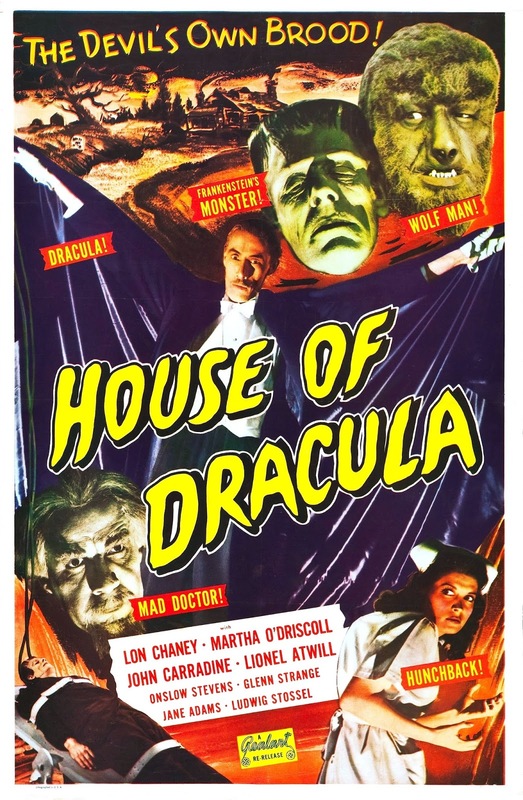 Meanwhile Dracula (John Carradine) hopes he can have his wicked way with Steven's winsome assistant (Martha O'Driscoll) Lurking in the depths is the Frankenstein Monster (Glenn Strange) about to be revived, yet again! Irresistible Nonsense! This entry in the Universal Holmes series does not reach the heights of the best in the series:THE SCARLET CLAW,THE SPIDER WOMAN,THE PEARL OF DEATH. Nevertheless THE HOUSE OF FEAR is still a pretty solid entry with reculsive gentlemen getting bumped off one by one at a remote Scottish mansion- Holmes and Watson to the rescue! 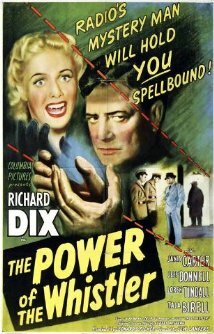 Recently the Sony MOD series has released seven of the eight "Whistler" B Movies in lovely new transfers.These films are as good as B Thrillers get haunting and engaging.This strong,rather disturbing entry in an excellent series has naive Janis Carter befriending a amnesiac (Richard Dix) unaware that he is,in fact an escaped psycho! 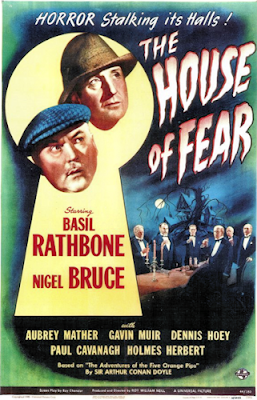 1945 England as imagined by Republic Pictures. It is certainly a most amusing parallel Universe. It's an England where pubs have "waitresses" who serve drinks on silver platters and come out with howlers like "I'm a lay-dee I am" Police custodial cells have "turnkeys" who can be bribed to release prisoners for a few hours so that they can commit the perfect crime with the perfect alibi. There is also a neat ambiguous supernatural twist at the end of the film. 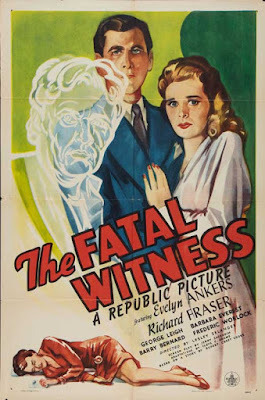 For a more accurate Republic Pictures version of 1940's England please refer to THE LONDON BLACKOUT MURDERS (1943). 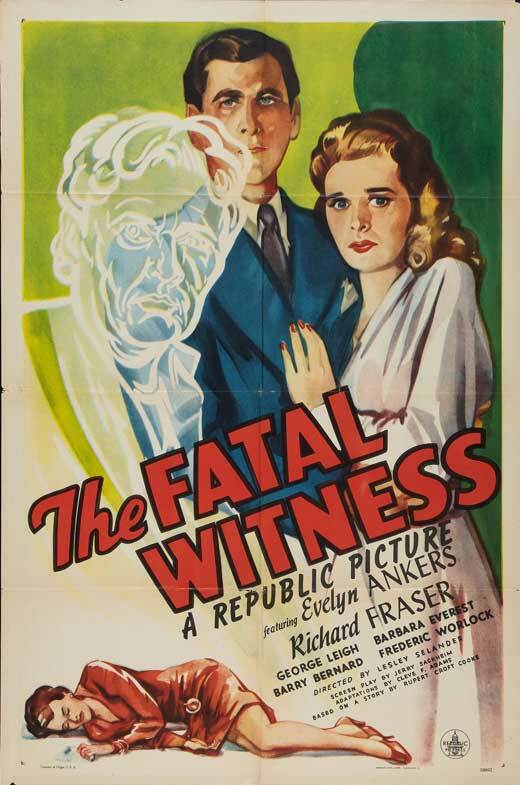 Republic Pictures does Val Lewton. John Abbott is a 400 member of "the Undead" a veteran of the Spanish Armada. He now runs a bar/gambling joint somewhere in Africa which gives him a constant flow of victims (ex pats and natives) to satisfy his blood lust. 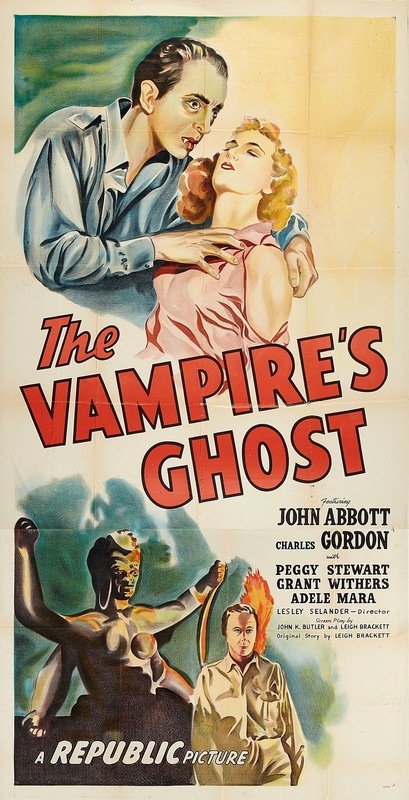 This Vampire Flick has no visible fangs or bats but it does have neat Voodoo elements thrown into the mix. Selander also directed another Lewtonesque Republic Horror the following year THE CATMAN OF PARIS (1946) The "Cat Man" courtesy of Republic's make up team looks like a cross between Mr Hyde and Nosferatu. Proof that Republic's B Western directors could also adapt to thrillers is further demonstrated by George Sherman's THE LONDON BLACKOUT MURDERS (1943) which this time has John Abbott dispatching victims with a deadly hypodermic concealed in his pipe! Interesting to see two Lesley Selander films listed and neither a western - he directed more than 100 B-westerns! Great selection, John! I only know 2 of these films, the Holmes and the Whistler, both of which I enjoy a lot. I have never come across the two Selander films at all. You've dug deep here, buddy! Hi John! Really interesting list, as always -- I think I'd only heard of the WHISTLER film. (Always enjoy Janis Carter.) Enjoyed your comments and look forward to more in the series! 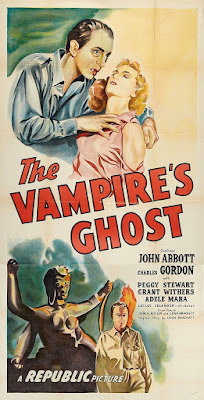 made some cracking thrillers as well as the cult classic DRACULA'S DAUGHTER. effort ( he co-produced) from a Curt Siodmak script. enemy agents-risking the fact his previous crime will catch up with him. I DO wish someone would release these little gems. I would love to have included CATMAN OF PARIS. one of the very best in a really strong series. Really neat picks! Of these I haven't seen the two Selander movies. Love the Whistler pictures, almost put one on my list. Catman of Paris and London Blackout Murders sound great too. Good year with lots to pick from, especially thrillers and crime Bs. It's interesting to see Selander do non Western stuff,especially Horror. LONDON BLACKOUT MURDERS was a real surprise-John Abbott Rules! know someone else loves The Whistler films as much as I do. I love the Holmes film, John. I first saw it on TV when I was very young and the marvelous atmosphere stayed with me - maybe it's not the best in the series but it's not far off either. The Universal monster mash films are fun but go too far I think. I reckon House of Frankenstein is the better one myself. As for the others, I've yet to see them but The Whistler mi=ovies are high on my wish list. A Movie production values...they look wonderful.